Post news Report RSS	Tumbling Apart has been Greenlit! 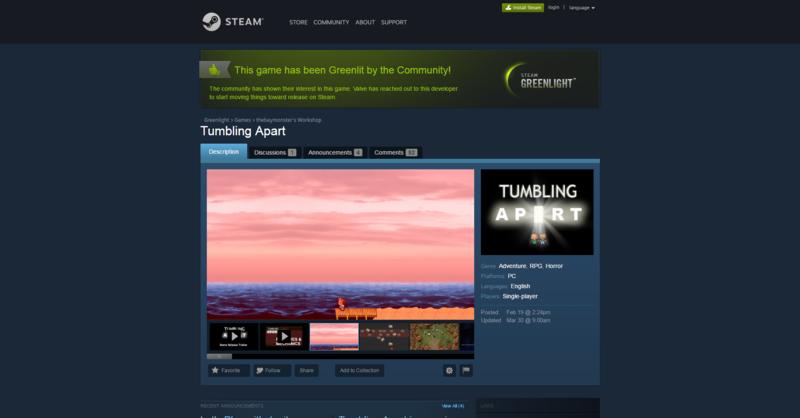 As of March 30, Tumbling Apart has been greenlit for release on Steam. We would like to thank everyone for the support. It's been incredible! As of now we have removed the demo, as it does not accurately represent what the final product will be. Expect a little bit of social media silence as our team puts our head to the grindstone in effort to deliver you the best and most touching story of love, loss, and redemption that is possible!